US #930 pictures Roosevelt and his upstate New York home at Hyde Park. On January 14, 1943, Allied leaders met in Casablanca, Morocco, to discuss the next stage of World War II. The conference was a secret. Days before the meeting, President Franklin Roosevelt boarded a train going north to make journalists think he was going to his upstate New York estate. Instead, he secretly switched trains in Baltimore and rode down to Miami to catch a plane. This made Roosevelt the first president to fly in an airplane while in office, and the first to leave American soil during wartime. 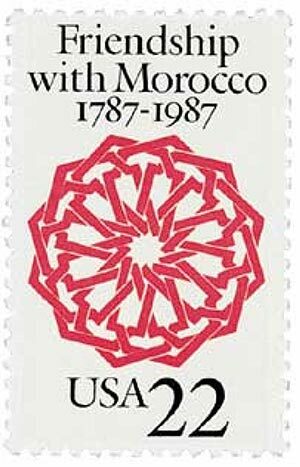 US #2349 honored the 200th anniversary of the Treaty of Friendship between the US and Morocco. From there Roosevelt had a long journey ahead of him – 10 hours to Trinidad and Tobago, nine hours to Para River, Brazil, 19 hours over the Atlantic to the Gambia, and 11 hours to Casablanca. He finally arrived on the evening of January 14, five days after leaving the White House. That night Roosevelt and Winston Churchill stayed up until 3 am discussing strategy. Also present at the conference were Charles de Gaulle and Henri Giraud. Joseph Stalin had been invited, but he declined because he had to focus his attention on the ongoing Battle of Stalingrad. 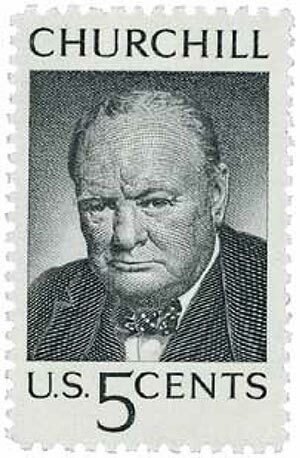 US #1264 was issued five months after Churchill’s death. The main purpose of the conference was for Roosevelt and Churchill to plan their military strategies for the next year. They planned to have their militaries draw Germany away from the Eastern Front, and would increase the number of supplies they were sending to the Soviet Union. They also decided to launch an invasion of Sicily, with the goal being to remove Italy from the war. At the same time, the Allies would start assembling troops in England for a landing in Northern France. 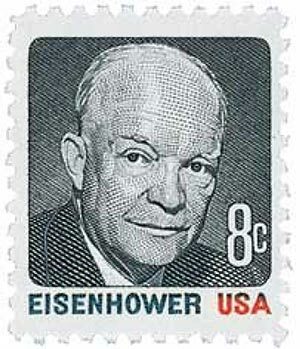 US #1394 was issued to meet an increased postage rate in 1971. Additionally, the Allies would also increase their strategic bombing against Germany. In the Pacific Theater, they agreed on a plan to remove Japan from Papua New Guinea and open up new supply lines to China through Burma. They also agreed to name Dwight D. Eisenhower Supreme Commander of Allied Forces. 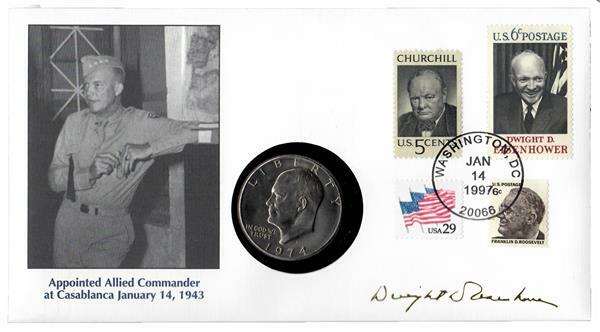 Item #59931A – Commemorative cover marking the 54th anniversary of the conference and honoring Eisenhower’s appointment as Supreme Commander. The conference ended on January 24, but the public wasn’t made aware of it until a few days later, once all of the participants had left Morocco. Once the results of the conference were made public, the doctrine of “unconditional surrender” was controversial, with some suggesting it was too extreme and didn’t allow for political maneuvering. However, the plans that came out of this conference would lead to an eventual Allied victory two years later. 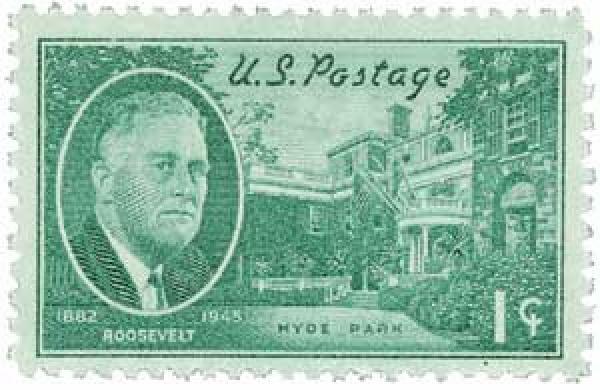 3 Responses to "This Day in History… January 14, 1943"
Another great story from Mystic Stamp Co. Your tid-bits needs to be shared with the High Schools. Interestingly, German intelligence picked up and read communications indicating that a meeting between the two would be held in Casablanca. They then out-thought themselves, reasoning that “Casablanca” was a poorly chosen code word for “White House” thereby missing an opportunity to mount an operation against the Allied leaders. Shortly after that, the U.S. introduced a new speech privacy system for senior leadership that remained invulnerable for the duration of the war.